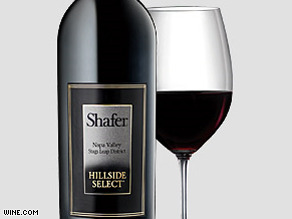 Shafer Cabernet “Hillside Select” 2003 can go for as much as $500 a bottle. (CNN) - The global economy may be undergoing a significant downturn, but the White House's dinner budget still appears flush with cash. After all, world leaders who are in town to discuss the economic crisis are set to dine in style Friday night while sipping wine listed at nearly $500 a bottle. The exceedingly pricey wine may seem a bit peculiar given leaders are in Washington to discuss a possible world financial meltdown, but Sally McDonough, a spokeswoman for Laura Bush, said it "was the most appropriate wine that we had in the White House wine cellar for such a gathering. McDonough also said the White House purchased the wine at a "significantly lower price" than what it is listed at. "Of course the White House gets its wine at wholesale prices," she said. "Given the intimate size of the group, it was an appropriate time for The White House to use this stock." The leaders of the U.K., France, Russia, China, India, Brazil, Saudi Arabia, South Africa, Turkey and 11 developing economies have all come to Washington at the behest of President Bush in an effort to express confidence in the fundamental underpinnings of the world's economy. (CNN) - CNN has learned that President-elect Barack Obama spoke with New Mexico Gov. Bill Richardson Friday to discuss the post of Secretary of State. A senior Democratic source tells CNN that Richardson’s name has always been on Obama’s list for that post. Obama has also gauged Sen. Hillary Clinton’s interest in the post if she were offered it. If Clinton does not express interest in the post, then Richardson and others would be candidates for the job. Another source close to the Obama transition team tells CNN that among the key details to be worked out with Sen. Clinton, should she express interest in the position, are issues of how her husband, former President Bill Clinton would be able to continue his work with the Clinton Global Initiative without complicating her work as Secretary of State. Boehner is being challenged for his leadership post. (CNN) - In the wake of fresh GOP congressional losses, California Rep. Dan Lungren is planning to challenge John Boehner of Ohio for the top Republican spot in the House. Lungren’s move is the latest sign some conservatives are unhappy with keeping same leadership at the helm of the conference as the party continues to re-group. A spokesman for Lungren declined to say Friday how many members are supporting the congressman in what is widely viewed as a long-shot bid. 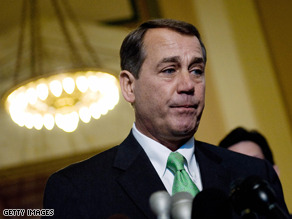 Boehner responded to the challenge with praise for Lungren. “Dan Lungren is a respected member of our conference and a man deeply committed to the principles that have defined our party since the beginning,” he said in a statement. Rep. Roy Blunt of Missouri has decided not to run for another term as Republican whip in the House. His deputy, Rep. Eric Cantor of Virginia, has already told his colleagues he will be a candidate for the position. Florida Rep. Adam Putnam, the Chairman of the Republican House Conference, is also relinquishing his GOP leadership post in the next Congress. Though former Maryland Lieutenant Governor Michael Steele and Michigan GOP chairman Saul Anuzis have both officially declared their candidacy for the position, Dawson said he won’t formally decided to enter the RNC race until “a later date.” In the meantime, the garrulous Southerner plans to spend the weekend brainstorming with Republican strategists, state party chairs and RNC committee members on ways to improve on the GOP’s dismal performance on November 4. “We certainly had some real bright spots in the Republican Party over the last election cycle, but we had a lot of bad news, so right now we are analyzing the situation and hope to make an announcement in the future,” he said. (CNN) - Valerie Jarrett tells CNN contributor Roland Martin that President-elect Barack Obama offered and she accepted a position in the Obama administration – she will be the Senior Adviser to the President and Assistant to the President for Intergovernmental Affairs and Public Liaison. The offer was made Friday but will be announced Saturday by the transition office, Jarrett told Martin. 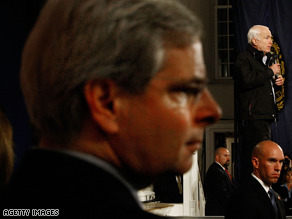 Jarrett is currently co-chair of Mr. Obama’s transition team and was senior adviser for his Presidential campaign. Sen. Patrick Leahy took a hard line on Lieberman Friday. (CNN) – A senior Democratic senator has gone on the record saying Joe Lieberman should lose his committee chairmanship when the party's full Senate caucus votes on the issue next week. "Every senator will have to vote the way he or she believes they should," Vermont Sen. Patrick Leahy, chairman of the Senate Judiciary Committee, told Vermont Public Radio Friday. "I'm one who does not feel that somebody should be rewarded with a major chairmanship after doing what he did. “I felt some of the attacks that he was involved in against Senator Obama...went way beyond the pale. I thought they were not fair, I thought they were not legitimate, I thought they perpetuated some of these horrible myths that were being run about Senator Obama. Earlier this week, Barack Obama reportedly said he held "no grudges" against Lieberman, who endorsed Republican Sen. John McCain’s presidential bid. Senate Majority Leader Harry Reid had avoided taking any public position on whether the Democrat-turned-independent should lose his chairmanship, but sources told CNN the Senate’s top Democrat had offered Lieberman leadership of a less powerful committee – a proposal the Connecticut senator rejected. 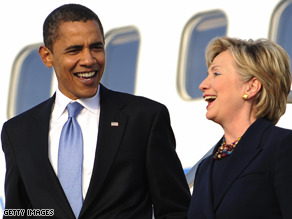 Sources say Obama asked Clinton if she is interested in the secretary of state post. WASHINGTON (CNN) - Multiple Democratic sources tell CNN that President Elect Barack Obama and Senator Hillary Clinton had a “serious discussion” Thursday to gauge Clinton’s interest in the post of Secretary of State, if she were offered it. Senator Clinton’s response is unknown, although multiple sources agree that Hillary Clinton was left with the impression that if she were interested in the post, it would be hers. “There was a serious discussion to determine whether, if offered Secretary of State, she would accept it,” said a source close to the Obama transition. In these circumstances, that source added, a president-elect does not meet with potential cabinet secretaries unless they are serious about making an offer. Over the course of the last 24 hours, sources close to Hillary Clinton have softened their one-time solid public position that she would not be interested in a cabinet position. Those sources now say that Hillary Clinton is clearly contemplating various ways in which she can serve the Obama Administration. On Monday, Senator Clinton responded to a reporter’s question by saying, “I am happy being a Senator from New York, I love this state and this city. I am looking at the long list of things I have to catch up on and do. But I want to be a good partner and I want to do everything I can to make sure his agenda is going to be successful." Another source close to the Obama transition team tells CNN that among the key details to be worked out with Clinton, should she express interest in the position, are issues of how her husband, former President Bill Clinton, will be able to continue his work with the Clinton Global Initiative without complicating Hillary Clinton’s work as Secretary of State. (CNN) - Rick Davis, the campaign manager for former John McCain's White House bid, came to Sarah Palin's defense in an upcoming interview with the National Review, saying the now-infamous $150,000 clothing tab for the Alaska governor was caused by a "failure of management." In the interview, set for publication next week, Davis notes Palin's appearance at the Republican convention came only days after she was named to the GOP ticket, and the Alaska governor had few clothes on hand that were appropriate for the event. “We flew her out from Alaska to Arizona to Ohio to introduce her to the world and take control of her life. She didn’t think ‘dress for the convention’, because it might have just been a nice day trip to Arizona if she didn’t click with John. Very little prep had been done and if it had, we might have gotten picked off by the press. We were under incredible scrutiny." News of the pricey tab caused a media firestorm days before the presidential election, and McCain aides appeared to blame Palin for the mishap, while the Alaska governor said she was forced to buy the clothes. (CNN) - Three officials close to the transition say prominent Washington lawyer Greg Craig is under strong consideration to be named White House counsel, the powerful post of the president's top lawyer. "He's a very strong possibility," said one person close to the transition, who added Craig is "highly regarded" and trusted for his discretion by Obama. A second official close to the transition was more bullish, calling it "all but a done deal" that Craig will be selected. A third official called Craig a "strong" contender at the top of the short list for the post. Craig did not return a call seeking comment. Cafferty: Is General Motors worth saving? 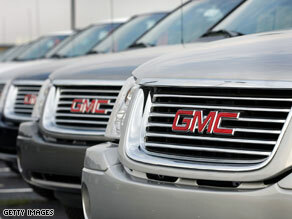 As GM goes, so goes the nation…That’s the old motto anyway. Financially neither one is looking so good right now. And General Motors, along with Ford and Chrysler, is looking for some help from our already cash-strapped government to get back on track. Estimates are if the Big Three go belly up, unemployment could hit 10 percent. But doubts about a bailout for the auto industry grew yesterday on Capitol Hill as Democratic leaders conceded they don’t have the votes to get a measure through in next week’s lame duck session. If General Motors fails– and it would likely be the first of the Big Three to fall because Ford is in better shape and Chrysler is a much smaller company– the impact would be huge.